We generally do this paniyaram varieties ( Sweet paniyaram and Kara paniyaram) in weekends for dinner. Its a favourite tiffin for all of us.Here I’ve mentioned the recipes of four different types of paniyaram. First variety is of Tanjore special which my MIL used to do (Both sweet and spice versions) .Then comes the recipe of a paniyaram which we tried after eating in AAB restaurant. Finally the one with leftover idli dosa batter which is my mom’s special. Lets see them one by one below. Wash and soak the rice, urad dal and fenugreek seeds for 2 hrs. Grind it together in mixie by adding little water in between( batter should be thick). Add the cardamom seeds while grinding. Take the batter in a bowl and add the powdered jaggery to it.Mix well.Make sure the jaggery is dissolved completely. Batter becomes slightly loose after adding jaggery. Heat and grease the Paniyaram pan(skillet) with oil .Scoop with spoon and fill each hole! Keep in high flame and cook for a minute by closing with a lid. Now simmer the flame and flip the paniyaram using a fork & spoon.Prick it with the fork for even cooking. Again cook in low heat to make sure they cook all the way through. Wash and soak the rice separately in a bowl and dal varieties in another bowl for 2 hrs. Coarse grind the rice along with red chilly,salt and hing in a mixie by adding little water in between(should be like semolina/rava). Then coarse grind the dal by adding little water. Mix the ground rice & dhal well. Heat and grease the Paniyaram pan with oil .Pour the batter in each mould till half – full. Keep in high flame and cook for 2 mins by closing the lid. Tastes great!! No side dish is required!! My MIL tried this after we had it in a restaurant.It came out well.Very easy to make and simple ingredients!! Wash and soak rice,dal with methi seeds for 2 hrs and grind it like a dosa batter. We made the batter in the morning and kept for 7-8 hrs to ferment. Add the pepper,jeera and coconut pieces into it and mix well. As usual, grease the paniyaram pan with oil and Scoop with Spoon off way each hole . Cover and cook for 2 mins.Flip it and again cover cook for 2 mins. It consumes very less oil ,at the same time it is very crispy. Serve hot with fried gram dal and tomato chutney!! This is my mom‘s paniyaram recipe. I just love this.I like this more than all the above said ones.Last week when i was with my mom, she made this just for me :)I know this one has been blogged many times by different people in the blogosphere. I decided to post it anyway . The recipe is pretty straight forward. To the leftover dosa batter add chopped onions, green chillies, curry leaves and grated ginger. Add the seasoning of mustard seeds and urad dal.Heat Paniyaram chatti (skillet). Fill the moulds with oil. I usually add little oil / ghee and add more if required. Cover the skillet. Cook the paniyarams on both sides. 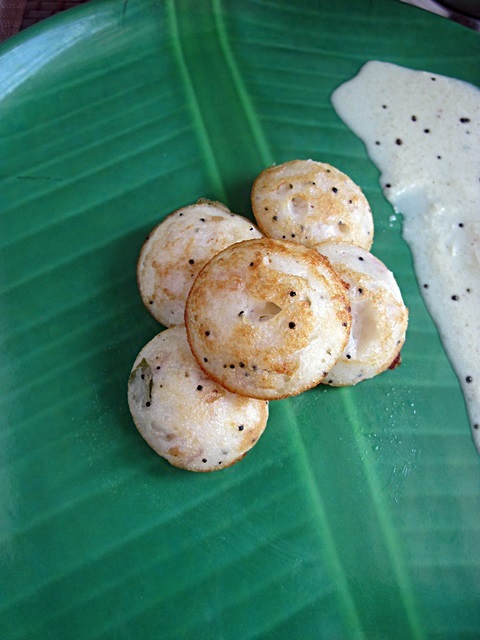 Serve hot with fried gram dal /Pottu kadalai chutney . Wonderful, Wonderful, Wonderful Chitra..Paniyarams are looking awesome..Thanks for your foot step to my blog and you have a lovely space here..Keep visitng and keep blogging..
chitra i liked your mom's one the best, also the piece abt jaggery is quite useful. One the chettinad delicacies,love all ur varieties, the most I like is kara paniyaram! They are all delicious! loved ur blog..im gonna follow it to keep up with your posts! loved the paniyaram recipes too! So many diffrent one you have made. Next tim i am gonna buy a pan when i am in Indi. Wow what a variety..awesome girl! I was going through some of ur recipes The most best thing i liked in ur blog is ur Kitchen clinic, That is simply the great attraction for me , keep it up!!! everybody who ever visits ur site will know cooking indian food is very healthy. i love these 'cos they don't need fermenting. it's hard to get anything to ferment in my house. Chitra, parade of paniyarams. I have not tried sweet paniyaram , surely do that. Perfect for the event. wow!! I love kaara paniyarams but really miss them now as I dont have a pan here :(.